How many times have you found yourself wanting to just call ahead to some food joint and get some take-out? On the way to a game? In between errands? In the middle of a road trip? Have you had any success getting safe, gluten-free take-out? I have found it quite difficult. I usually pack something with me and don't even think about trying grab something on the way anywhere. Sometimes you need just the right take-out, so that you don't have to cook. Like to take to an outdoor performance of Shakespeare? You bet. I wanted something good, something safe, and something we didn't have to cook ourselves. Enter Tino's Italian Bistro. It was on the way, looked good, and it has a gluten-free menu! My husband and I were on our way to an outdoor Shakespeare performance and we were armed with a very nice bottle of my favorite merlot. Now, we just needed the right food to go with it. And that right food had to be gluten-free for me. Planning ahead really pays off. A bit of research, and I had my solution right before my eyes. Before ever leaving the house. 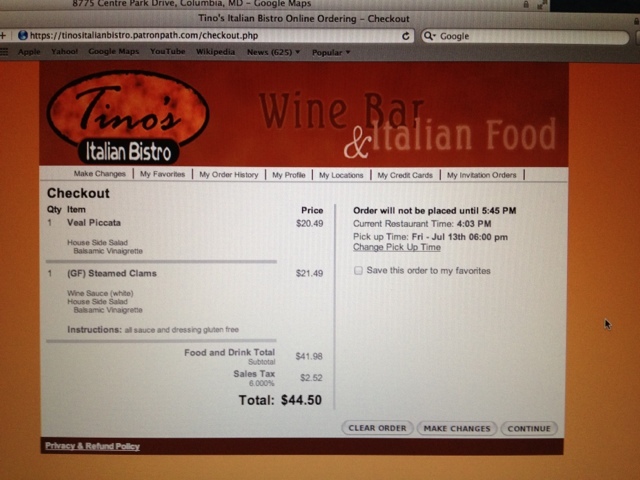 Tino's has online ordering available. They offer seating in their regular restaurant, but they will also pack everything up for carry out. They offer traditional, glutenated Italian selections, but they also have quite a few gluten-free options. Fantastic! There's nothing better than being able to please everyone! And the gluten-free options are right there, ready for you to select. Just to be sure, I called them to ask about the salad dressings. Yes, they are gluten-free. All of our food was ready, on time, when we arrived, on time. 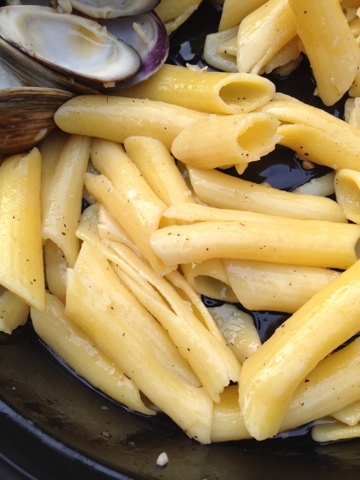 I even asked, in person, if the gluten-free pasta was cooked in separate water, to avoid cross-contamination. Yes, everything is prepared separately for the gluten-free orders. Nice. Just the way I like it. We had a nice, big, easy-to-carry bag of our food to take to the performance. We starting digging in as soon as we took our seats. And I forgot to take a picture of my side salad before chowing down. Here's what was left by the time I remembered to record what was in front of me. I had to ask my husband to hold the container for me. One-handed picture taking is not recommended. 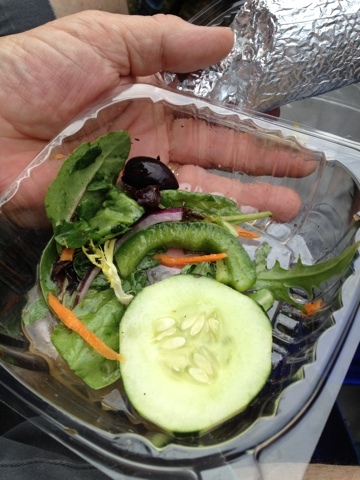 It was simple garden salad, and everything was fresh and good. Then it was time for the main course. 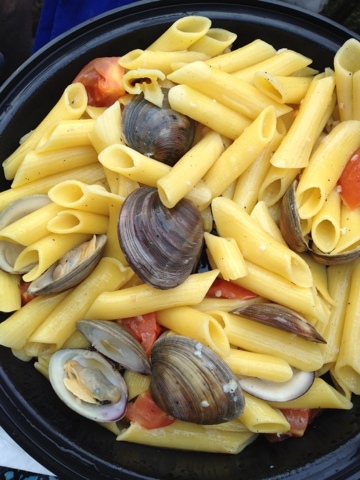 I ordered steamed clams in a white wine sauce. And, yes, I had checked that the sauce would be safe too. This looked so good. I dug right in. It tasted so good. Never mind that I ordered seafood and was drinking red wine. I prefer red wine. Red wine is better than white. Unless, of course, you are cooking with it. Then both are great, depending on the dish. Those steamed clams went faster than anything. Excellent! Then, as I stirred the gluten-free pasta a bit to distribute the white wine sauce, I noticed this. Do you see the shredded pasta? Much of that gluten-free pasta was overcooked. It was split and in pieces. It tasted okay, but the texture was just a bit too soft for it stay together in whole pieces. This was a bit of a disappointment. I looked over at my husband's glutenated pasta entrée. It looked fine. It wasn't split and overcooked. I wondered if they cook the gluten-free and gluten pastas for the same length of time, and maybe that is too much time for the gluten-free version. I don't know. But overcooked pasta is not my favorite thing in the world. Of course, it would have been worse if I had also gotten sick. I did not. So, let me celebrate the fact that I did not get sick, I did eat take out, and I didn't have to cook it myself! Overall, it was a good meal. It was a very good take-out meal. It just wasn't perfect. 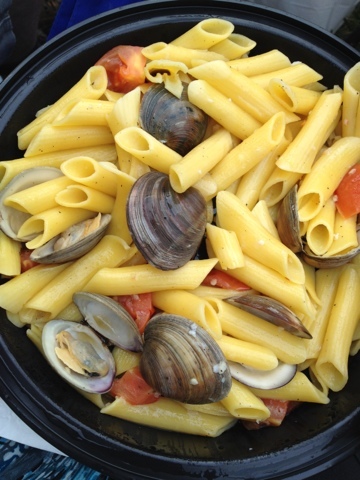 If you have a mix of gluten and gluten-free eaters in your group, give Tino's a try! Maybe my gluten-free pasta was not the norm. Maybe your experience will be even better!